Robotic Integration vs. Manual Load - How to Choose - CellCon - A Division of Mittler Bros.
CellCon – A Division of Mittler Bros.
What’s the best way to handle parts in your manufacturing process, and will robotic integration increase efficiency to a meaningful degree? Manufacturers want to produce high quality parts in the most efficient way possible. When designing or managing a manufacturing process, the question of robotics comes into play. When loading parts into a CNC machine, for example, should it be done by a robot or by a human? Robots offer several advantages, but humans are sometimes the better solution. One key to a successful manufacturing process is to control the variables. Once a robot is programmed and set up, it reliably performs its tasks, every single cycle. A human operator, on the other hand, is a significant variable in the manufacturing process. When asked to design a custom manufacturing solution, we often present options. Those options usually come with a recommendation. In some cases, we present an option for parts to be loaded using an integrated robot instead of a human. In one case, based on the client’s specified production target, we recommended the CNC robotic integration option. The initial cost was higher, but we believed it to be a better choice for their application. Our customer chose the version without robotics. Although the system works as designed, they have never been able to meet their production target. Our customers frequently tell us that qualified people are hard to find. They cite problems related to attendance, focus, consistency, and morale. That begs a key question. How does a manufacturer know when to have a human load the machine, and when to have a robot do the work? It starts with understanding the capabilities and advantages of using an integrated robot. Robots are the masters of repetitive motion. When humans perform the same tasks over a long period of time, health concerns frequently surface. Robots perform the same task, the same way, every cycle, regardless of the part’s weight or size. Robots offer great advantages. But they come with an obvious price tag. The challenge is knowing when it’s worth the investment. At CellCon, we don’t automatically assume that robots are the answer. We draw from many years of experience and a few basic questions to provide solid guidance. What is the weight and configuration of the parts? The answer becomes easier with heavy or long parts that require a great deal of effort, or multiple people to handle. One of our projects involved unusually heavy pieces. They used to require two people and a crane to put the parts in place. CNC robotic integration was one of our design features that greatly decreased our customers’ cycle time. Can a human keep up? Examine your current process. Is the operator outpacing the machine, or is the machine waiting on the operator? If the machine is waiting on the operator, we take a serious look at a robotic solution. What is the available labor pool? Using CNC robotic integration in a manufacturing cell is sometimes dictated by the available labor force. The answer isn’t the same in every area. Some regions have plenty of qualified people available. Other areas offer great value on real estate, making a compelling argument to expand. If labor is in short supply, a robotic solution is considered as a strong possibility. What is my parts mix? Like any other CNC machine, a robot requires programming, tooling, and setup. Low volume runs with a large mix of parts usually favor a human to load the machine. When the parts mix is small, and the volume is high, robots typically offer great improvements in production. Even with integrated CNC robotic solutions, we often design systems that benefit from the supervision of a person. With the robot doing its part, trained personnel monitor inventory and alarms. Robots are mechanical devices that require care. Though rare, breakdowns are possible. When supervised by a person, quick response to an alarm minimizes down time. With careful attention given to inventory, a human maintains proper stock levels, reducing cost and space requirements. Are you designing or managing a high production manufacturing process? Making a choice to use robots to load your machines is one thing. Getting the benefits of a proper implementation is another. Despite claims of compatibility, we have seen unfortunate situations where a robot and a machine tool were not ready to play together. The installation became time consuming and costly. If robotic integration is a consideration for your project, dig deep and ask several good questions to verify that your systems will be fully compatible. Robotic integration may or may not be right for you. 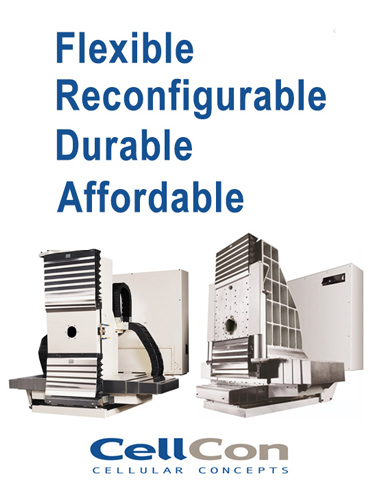 Regardless, CellCon offers modular CNC machine tools, and custom services to design an entire system to meet your requirements. We are the premier builder of modular CNC machine tools in the western hemisphere. We are also Certified Fanuc CNC integrators and Certified Fanuc Robotics Integrators. Additionally, our custom solutions are compatible with most brands of robot. With decades of experience, CellCon offers a staff of highly qualified experts. We specialize in robotics programing, setup, tooling, and integration with CNC machines tools. Call us at 800-467-2464 to learn how CellCon will help you accomplish your production goals. © 2017 CellCon a Division of Mittler Bros.